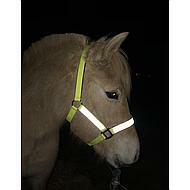 PP headcollar with reflective noseband and reflective cheekpieces. Adjustable noseband and crown. 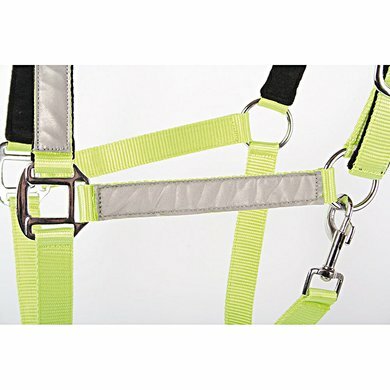 Simple halter with fixed ring under the chin and adjustment possibilities behind the ears. Softly padded with fleece and provided with clear reflection strips on the nose and baking pieces. 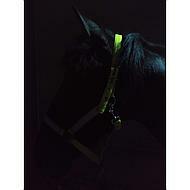 Great to use during the evening walks or rides in the dark under / over your bridle. Reflects excellent! The size Full was perfect for my cob-size mare at the smallest hole, the nose is not very spacious. Very handy to walk with your horse at dusk. 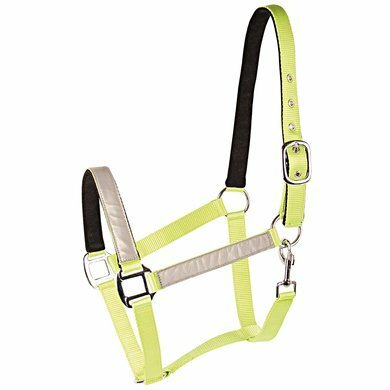 The halter is also pretty sturdy.